This area of the gallery was to be devoted to presenting music I composed in support of Lunar Mission One, the international, public-funded exploration of the south pole of the moon, and the mission's cultural and educational activities. The composition First Light marked the beginning of what I hoped would become a suite of works to be composed over the ten years of the project. The piece starts quietly before evolving into a series of flowing arcs and repeating themes. The piano gives way to the beautiful sound of the duduk, a woodwind instrument indigenous to Armenia. The main theme is introduced by the oboe then developed by the clarinet and piccolo flute, as the violin, viola and cello intertwine with sound designs and a small string ensemble. 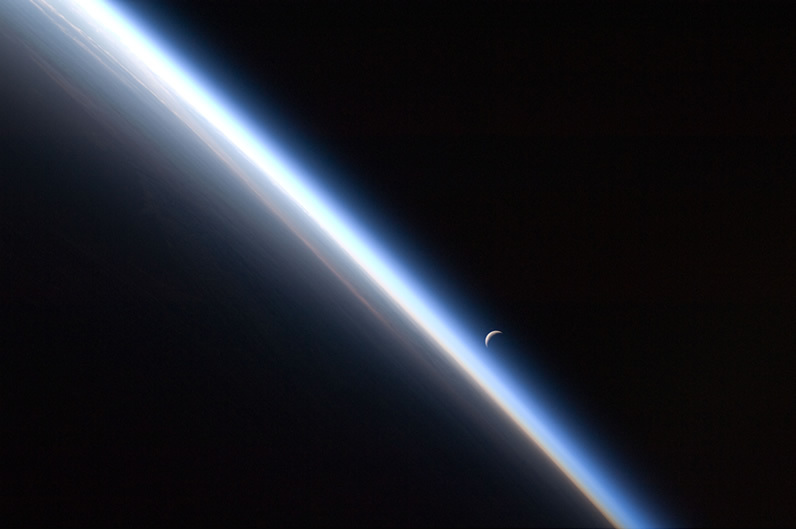 Photo Credit: Crescent Moon, Earth's Atmosphere - NASA, International Space Station, 4th September 2010. A setting last quarter crescent moon and the thin line of Earth's atmosphere are photographed by an Expedition 24 crew member as the International Space Station passes over central Asia.